Enjoy a scenic drive through the winding White Hills of Shelton on your way to Jones Winery, a historic 400-acre farm that's part of Connecticut's Wine Trail. For just $5, you can partake in the farm's wine tasting festivities, held on Fridays, Saturdays and Sundays during the summer months. The place surrounds visitors with a peaceful, quaint country atmosphere, filled with empty wine barrels, old garage barns, antique tractors and pick-up trucks. Make your way to a large, rustic red barn, previously used as a dairy barn. Enter the old milking parlor and take your place next to a long, imposing wood countertop. The countertop was fashioned from one of the farm's largest trees planted by the original Mr. Jones - Philip Jones, a Welsh-Irish immigrant who began farming the land in the 1870s. Here, the Jones' wine tasting experience begins with a question: "What do you like about wine?" Photographs depicting the winemaking process line the perimeter of the tasting room. The images show grapes being harvested from farm's 25-acre Pumpkin Seed Hill, as well as the bottling process, all done on-site. Soothing background music and the friendly staff provide a comfortable vibe. The staff, consisting mostly of Jones family members, efficiently explain the sampled wines to guests, whether they be novice drinkers or aficionados. Jones Winery is also accommodating to families with children. A small play area stocked with toys and videos is set-up within view of the wine tasting area. Strawberry Splendor, a sweet wine made from the farm's famous strawberries. More than 80 percent of products used to create the Jones family wines are Connecticut grown. All wine tasting participants receive a complimentary wine glass. Then it's on to the winery's gift shop where visitors can purchase the wines they tasted that afternoon along with the other bottles that are not "in season." Bottles range from $11.25-$18.75. The gift shop also features a variety of collectibles meant to enhance the serving of food and wine, such as a large display of salt and pepper shakers. Visitors to the winery should also check out the farm's pick-your-own fresh seasonal produce, including strawberries, blueberries, pumpkins and Christmas trees. Tastings and tours are held on weekends from May to December, 11 a.m. to 5 p.m.
For more information, go to www.jonesfamilyfarms.com. Learn more about the Connecticut Wine Trail at www.ctwine.com. 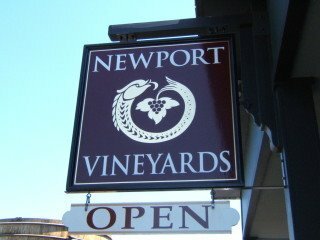 Middletown's Newport Vineyard's S.E.N.E. Pinot Grigio was recently selected as the 2006 Best Rhode Island Wine in the first Big E Northeast Gold Wine Competition. The judging was held on May 28 in Cromwell, Conn. Winners will be showcased and on display during this year's Big E in the State Buildings during this year's 17 day Fair in West Springfield, Mass., Sept. 15 to Oct. 1. Priam Vineyards of Colchester's 2003 St. Croix won Best Connecticut Wine. Best Massachusetts Wine went to Obadiah McIntyre Farm Winery, located in Charlton, for its 2004 Red Raspberry Wine. A Cayuga White from Jewell Towne Vineyards, South Hampton, won Best New Hampshire Wine. Putney Mountain Winery in Putney was awarded Best Vermont Wine for its 2004 Apple Maple. Best Maine Wine went to Winterport Flying Dutchman, from Winterport. Three panels of judges sniffed, tasted and graded 182 wines on numerous qualities. A total of seven Double Gold Medals were awarded -- Obadiah McIntyre Farm Winery's 2005 Peach Wine and 2004 Red Raspberry; Priam Vineyards' 2003 St. Croix; Hazlitt 1852 Vineyards' 2005 Harvest Reserve Riesling and Finger Lakes Cream Sherry; Alison Wines & Vineyards' Fraise Strawberry; and Hunt Country Vineyards' 2005 Late Harvest Vignoles. Charlton winery produces award winning handcrafted fruit and grape wines, is open 12 months a year, and sponsors tasting events throughout the year. The farm grows a variety of fruit, including the fruit for their award winning Black Gold Blackberry Wine. They make more than 20 varieties of wine, with 14 of them international medal winners. Last, July 2005, Nate's Hard Cider was awarded a Concordance Gold, Best of Class medal, and this year it has won another Gold Medal. Other 2006, Medal winner include their Crimson Gold Red Raspberry and their Peach Wine, both winning Double Gold Medals at this years Eastern States Wine Competition. Their Riesling won a silver medal and their Blueberry Wine won a bronze. The winery is located at Charlton Orchards Farm, Route 20, in Charlton Massachusetts. Founded in 1733, the farm is one of the oldest settlements in south central Massachusetts. They are only 15 minutes from Historic Sturbridge. And they have two fun events coming up before end of summer. Join us at Charlton Orchards and Obadiah McIntyre Farm Winery for our Annual Grill Your Own Steak and Wine Dinner. We think you will really enjoy this event. The evening begins at 5:00 pm with wine and hors d’oeuvres, at 6:00 pm we will bring out the thick sirloin steaks for you to grill to perfection. We will provide all the side dishes and the housekeeping. Barbeques are a great place to unwind and visit with friends. Enjoy our Wines, Merlot, Cabernet Sauvignon, American Zinfandel, Chambourcin, and our 2003 red blend Charltage. After dinner, as you relax, we will be serving our delicious desert wines, with our equally delicious pies. The cost for this event is $38.00 per person. We want everyone to enjoy themselves, so we will also offer a special discounted deal for the designated driver in your party. Call us for more details. As a special thanks to you for being our guest, take home a free souvenir wine glass. Must be 21 years of age to attend. Event hours 5:00pm to 8:00pm. $ 38.00 admission. Reservations are required, tickets go on sale June 15th This Event is Limited to only 40 people. Join us for mounds of Blueberries, as we join friends and family together to celebrate this year’s blueberry crop. The grills will be hot, and the food great. Our Wine Bar will have our award winning Nate's Hard Cider on tap and as a special treat blueberry and peach daiquiris. Wine tasting, will be available in our winery and as always tons of food and fresh country air. Paula Red apples will be available for pick-your-own. The Blueberry Patch will be open for pick-your-own, and if all goes as planned we will also have raspberries, blackberries and peaches for pick-your-own. Fun for all Ages. Blueberry Pie Eating Contest: 3 age groups 7-10yrs, 11-14yrs and adult. Prizes for the winners. Contest begins at 3:00pm. So come on blueberry pie lovers, show us your stuff. Event hours 12:00pm to 5:00pm. free admission. New York state has been cleaning up in numeorus wine competitions. These 2006 competitions include the Amenti del Vino, Dallas Morning News, Finger Lakes International Wine Competition, Florida State Fair International Wine Competition, International Eastern Wine Competition, Jerry Mead's New World International, and the LA County Fair Wines of the World. has gone about things differently. blanc and zinfandel and pinot noir, among others. pinot noir I made tasted like something that ought to run my car." Virginia and one of only three on the East Coast. said, "there were only 300 acres of Viognier growing in the entire world." Wasn't that an extraordinary gamble? season's grapes in the bud. The second can rot them on the vine. sprays to circulate among the individual grapes. found, remained remarkably consistent from year to year in his vineyards. of variation in quality, but the '93 vintage was really off the charts," Horton said. in the bottle. "I thought we'd never sell it all," he said. But after the '93 vintage, the wine soon began to sell itself to anyone who tasted it, even at $20 a bottle. wine grape for the state." Will Viognier become the new chardonnay? not counting his fruit wines. Hermann's backyard winemakers about the former glories of the Norton grape. The thick-skinned red varietal was one of the first Horton planted. like chewable wines, a genuine gustatory adventure. makes the whole thing taste like Norton." True, it isn't Horton Viognier, but then, what is? Rappahannock Cellars 5th Anniversary Celebration! And 5 New Medals! HUNTLY, VA - Rappahannock Cellars (Rappahannock) was awarded a total of five gold, eight silver and four bronze medals at these prestigious wine competitions. The 2006 Annual International Eastern Wine Competition (IEWC), the 2006 Riverside County Fair Wine Competition, the 2006 Virginia State Governors Cup Competition, and the 2006 Finger Lakes International Wine Competition. Rappahannock's 2005 Reserve Viognier grabbed 4 gold medals, along with a gold medal for their 2005 Noblesse Blanc. Silver medals were awarded to the 2004 Reserve Cabernet Franc, the 2004 Meritage, 2004 "Wild Ferment" Chardonnay, and the 2005 Viognier. Bronze medal winners were the 2005 Seyval Blanc, and the 2004 Viognier Reserve. The IEWC is one of the oldest and largest wine competitions east of the Rockies and features wines from around the world. The Riverside County fair is an international wine competition held in California; while the Dallas Morning News Wine Competition is a prestigious competition held in Dallas, Texas. The annual Virginia Governors Cup Competition is restricted to Virginia wines; and the Finger Lakes International Wine Competition is held in New York and hails wines from around the world. "Needless to say we are very pleased with these awards, as they are a sign of our increased commitment to building Rappahannock Cellars as not only a leader in Virginia wine, but also as a top tier producer of world class wines" remarked Rappahannock's owner John Delmare. Recognizing the promise in Virginia wines, John Delmare moved his family's winery from California to the Blue Ridge Mountains in the heart of Virginia. Rappahannock Cellars will be celebrating their 5th Anniversary on July 29th & 30th with a New Release Weekend. They will be celebrating the official release of their 2005 Claret and 2005 Chardonnay, and the weekend will also feature live music. Dominique and I like Rappahannock very much....but we won''t be able to go down. But if you're around you should go and check it out. July 29th from 2 until 5 p.m.
July 30th from 1 until 4 p.m.
Nashville-based, multi-platinum producer, Mark Heimermann refers to "as one of the best he's heard in his twenty plus years of producing singers." Dominique and the boys went out for a drive in the country, and crossed ovver the New York/Massachusetts boder, on our way to Tanglewood and Lenox, Mass, in the Berkshires. On our way we came across Hilltop Orchads, hich is home to the Furnace Brook Winery as we were passing through Richamond, MA. So which is it? An orchard or a winery? "We got the idea of starting a farm winery so that we could produce our Johnny Mash hard cider here at the orchard," writes John Vittori on the Orchard's website. "Once we invested in the winery equipment, we saw an opportunity to expand on our original plans." The wonderful spot offers pick your own apples (21 varieties),free hay rides, organic produce, and wonderful baked goods, including cider, cider donuts, freshly baked pies, muffins, and breads. And of course cider and wine. The Vittoris established their winery in 1999, and have 200 acres, most of which are planted to apples. They produce 3,000 cases a year. The produce mostly dry classic wines and hard cider. The first two most important are the ciders. The Furnace Cider is a wonder, off dry French-style cider, with a lovely touch of clove. Even in the middle of a hot humid July summer day, a sip of this chilled sparkling cider immediately brought to mind fall foliage and a desire to put on your favorite wool sweater. The other, served in beer bottles is the popuylar Johnny Mash hard Cider. This is a semi-sweet classic cider. With a look like champagne, and a wonderful taste, this was another excellent cider. What a find these two were on ahot summer's day. They also made a wonderful reisling, a very nice muscato,, and a very drinkable light pinot noir. And a nice chardonnay to boot! This is a lovely stop in the Berkshires, and if you're going up there...stop by and tell the Vittoris were told you to say hello! Howard G. Goldberg wrote a glowing review of Macari Vineyards in the July 9, 2006 New York Times. He raved especially about the Sauvignon Blanc, it's Chardonnays and Cabernet Franc. Of the Sauvignon Blanc, Howard wrote, "Like its predecessors, Macari's pale, tangy and stylish 2005 edition ($15.99) is an aromatic, slightly herbal crowd-pleaser intended for immediate consumption...Fans of Macari sauvignon's creamy texture and its lingering grapefruity flavor, which has almost a gin-and-tonic snap, will not be disappointed." As a amily, we often took a house in Rhode Island for a week, every summer. A few summers ago I dragged Dominique to yet another winery. And we ended up at the nicest New England winery we ever saw - Greenvale Vineyards. Greenvale Vineyards of Portsmouth, Rhode Island, a 19th century Victorian farm, is entering its tenth year as a winery operation and its 20th year as a vineyard operation. The Parker family, now in their fourth generation, built the "Ferme Orne" throughout the 1860s. Cortlandt and Nancy and their four children started their vineyards in 1982 in an effort to develop a productive use of the family farm located along the Sakonnet River. We began as growers. Greenvale's first release was the 1993 Chardonnay. 350 cases were produced and very well received. Greenvale's 1995 Chardonnay totaled 550 cases and the 1996 Chardonnay totaled 850 cases. The Cabernet Franc produces 250 cases a year. In 1997, we produced 2,400 cases of wine. At full capacity, the winery will produce approximately 5,000 cases of wine annually. We had bought several bottles of the 2001 Greenvale Chardonnay. Recently, we pulled out a bottle of it while in upstate New York. Suddenly, the summer winds of several years ago washed over us. We took one sip and closed our eyes. We could see the beautiful estate, and feel the Rhode Isalnd seas breezes as we tasted this wonderful wine. This is a well-balanced dry, light white wine with lovely, fruity aromas. 75% was aged in Frenc oak, and the other 1/4 was aged in stainless steel, giving it a lovely smooth taste, but with the perfect amount of acidity. Fabuous. We may be in the upper Hudson Valley this summer, but this chilled little bol=ttle of white brought the memeories of the wonderful Rhode Isalnd summers right back. Go and try some and expereince your own lovely New England summer. So, it was a lovely summer night, and we had our option of having a nice red with a salad my wife made of spring greens, grilled chicken, and a fabulous bluecheese vinigrette dressing. We sat on the deck, looking out over the lawn. There was a slight breeze and I decided to try something new. I had been in Washington DC in May for the BEA (the publishing trde show) and I found a local wine shop that sells Virginia wines. I went home with a half case of numerous wines. One of the recoomendations of the wine stewards there was a Whitehall Vineyrds Touriga. White Hall Vineyards quickly established itself as a producer of fine wine in Virginia, winning the industry’s most significant competition-the Governor’s cup- twice in succession: 1997 & 1998. Owners Tony and Edith Champ set the tone for the winery’s signature style: a fruit-forward richer style is typical in Virginia. The Champs’ preferences were influenced by exploring the California wine industry from its evolutionary stages in the 1960’s through the ‘90’s. White Hall wines, however, are all Virginia. And the 2004 Touriga is no exception. It won a Gold medal at the 2006 Dallas Morning News Competition and scored 87 points in the Virginia Wine Guide. White Hall's first vintage of the Portuguese varietal, Touriga Nacional, was harvested on September 15, 2004. It was fermented in a combination of small bins and using the French Delestage method. The wine was then aged for ten months in French and American oak. Blended with some Tannat. The wife was a little spurious of the offering. She wasn't familiar with Touriga, and inquired if we had a back up bottle of red just in case this one didn't work. There was no need. According to the winery, "the 2004 Touriga is deeply colored, smooth and rich in dark fruit flavors...Deep color with intense aromas of black cherries, and spice with a rich smooth palate of plums, black currants, and well integrated oak and tannins." They only produced 308 cases...and if you missed it, believe me you missed something special. This is everything they say it is. A nicely made, medium bodied red, long on deep berry flavors and enough acidity for blance. Easilly one of the better red wines of Virginia. With a fresh loaf of garlic bread bread made on the grill and the salad with the fresh grilled chicken, it was a tremendous experience.